I Buy Way Too Many Records Dot Com: Friends Of Cesar Romero - The Hold 7"
Any label can manage to put out one good record. There's plenty of examples of this, I don't need to take the time to list them off. When a label starts to string together several great releases, that's when you know the folks running it are onto something. And when a label starts putting out great record after great record AND they're from mostly new bands; that's when you know that this is a label you can count one. Snappy Little Numbers are absolutely starting to fall into that category. 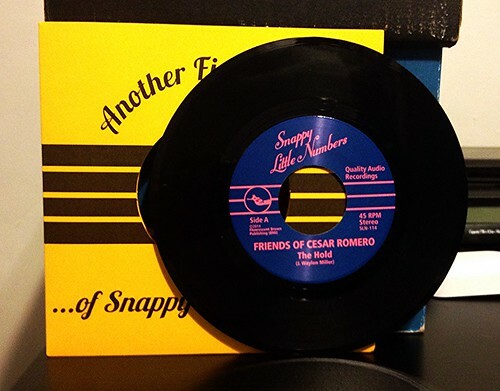 Friends Of Cesar Romero are probably the one of the more senior of the bands on Snappy Little Numbers, but I certainly wouldn't classify them as a household name just yet. Though they really should be. The A-Side "The Hold" is is a mid tempo, vaguely 60's sounding song, but doesn't come off as a pandering retro throwback. Background organ flows through and helps build to a bouncy chorus with a banging snare that punctuates everything. B-side "Teisco Telestar Stomp" sounds a bit tougher; it's not quite as poppy as side A. It has a little more punch and it leans more towards a garagey sound. If you could get away with saying the word swagger and not sounding like a dipshit, I'd say the band has some real, old school, tough kid swagger. But now I sound like a dipshit. Regardless, both songs are pretty outstanding and you should really check out everything Snappy Little Numbers is putting out. They're onto something.